Soufflés are often considered delicate in nature and very difficult to prepare. We’ve all heard horror stories of failed attempts. They are told with such angst that “The Night of the Unrisen Soufflé” has become a kitchen cult classic. The reputation of this dish is nothing more than a culinary urban legend. They are fairly easy to execute once the basic ingredients and techniques are understood. I first learned how to make them while completing a program at a Culinary School in New York City. Classic French Technique was the curriculum. An entire section was devoted to eggs. Soufflés were a dominant subject matter. I never really made them again after completing the course requirements. Then about 10 years ago, I found myself overwhelmed by the need for a change. I sold my apartment, quit my job, and moved to Arizona to loaf in the desert. Needless to say, I had a lot of free time on my hands. Much of this time was spent in the kitchen trying to perfect certain dishes and expand my repertoire. A renewed interest in Soufflés arose during this time period. I wanted to whip them up from scratch without relying upon a recipe. Cooking should be an improvisational process. Memorizing predetermined references and then adhering to them religiously will ultimately stifle your creativity. Learning the ratio of ingredients and understanding the basic cooking technique a much easier approach. For example, if someone asked me how to cook rice, I would respond “2 to 1. 15 on and 15 off”. This translates to: TWO parts water to ONE part rice. Bring to a boil, then simmer for 15 minutes ON low heat. Let stand 15 minutes OFF heat. The balance of the recipe is intuitive such as adding salt or butter to the water beforehand. The basic ratio for a Soufflé is conducive to this methodology. It took about 10 attempts to realize a suitable yet easy ratio to remember would be “1, 2, 3, 4, 5. 30 to 45 on 350”. Heat ONE cup of milk over low heat. 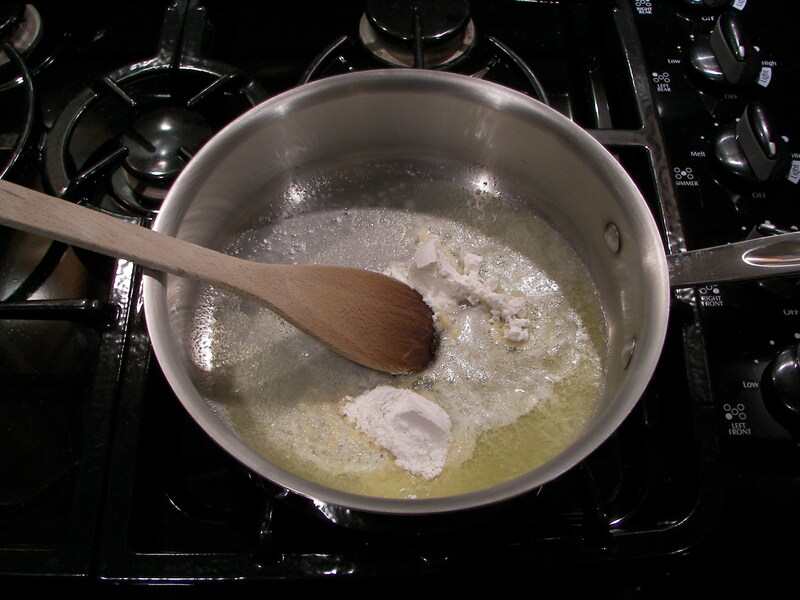 Make a roux using TWO tablespoons of butter and THREE tablespoons of flour. Add milk to create a thick Bechamel sauce. Separate FOUR egg yolks and FIVE egg whites. Fold eggs yolks and other flavor components into the béchamel. 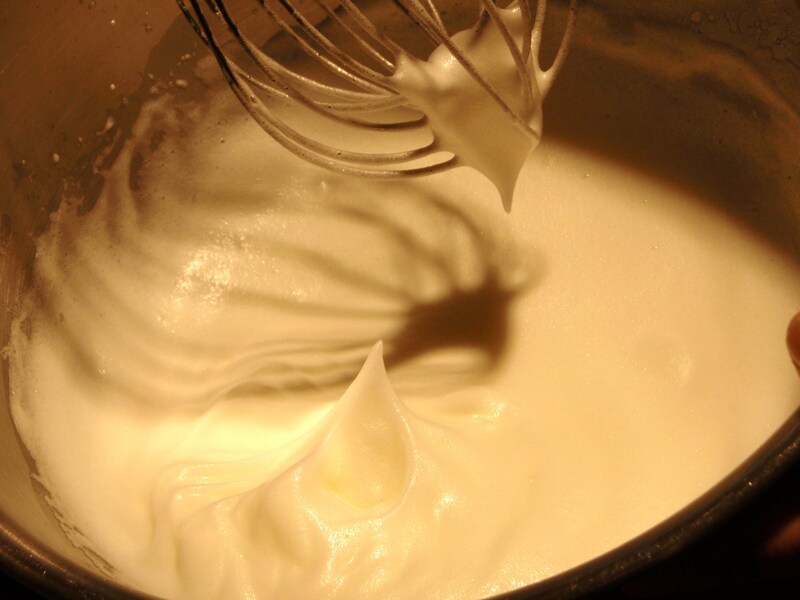 Whip egg whites to stiff peaks and fold into béchamel. Bake in a greased dish for THIRTY to FORTY FIVE minutes at THREE HUNDRED AND FIFTY degrees. Now I make them on a regular basis. They are the perfect choice for a lighter meal when paired with a salad. Create your our version by altering the flavor components (In this case Cheese and herbs). Separate the egg yolks and whites. Make sure no traces of yolk remain in the whites. The egg yolks will eventually be incorporated in the Soufflé base. They can be placed in any size bowl or container. The Egg Whites will by whipped into a frothy mass and folded into the béchamel base. 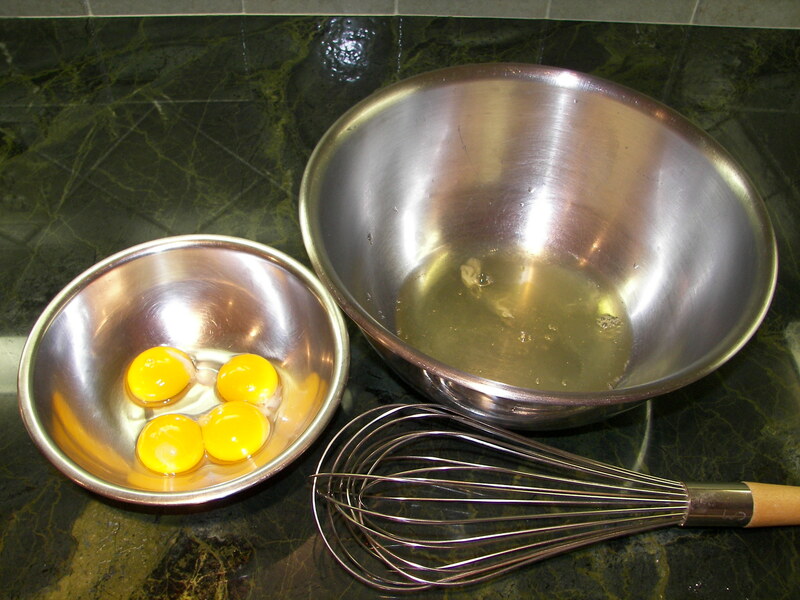 Select a bowl large enough to accommodate the egg whites once they are whipped. A copper bowl is the ideal choice although Stainless Steel will work equally as well. The yolks can be refrigerated until needed. The whites seem to whip up quicker when they are room temperature. Cover the bowl containing the egg whites and set aside. 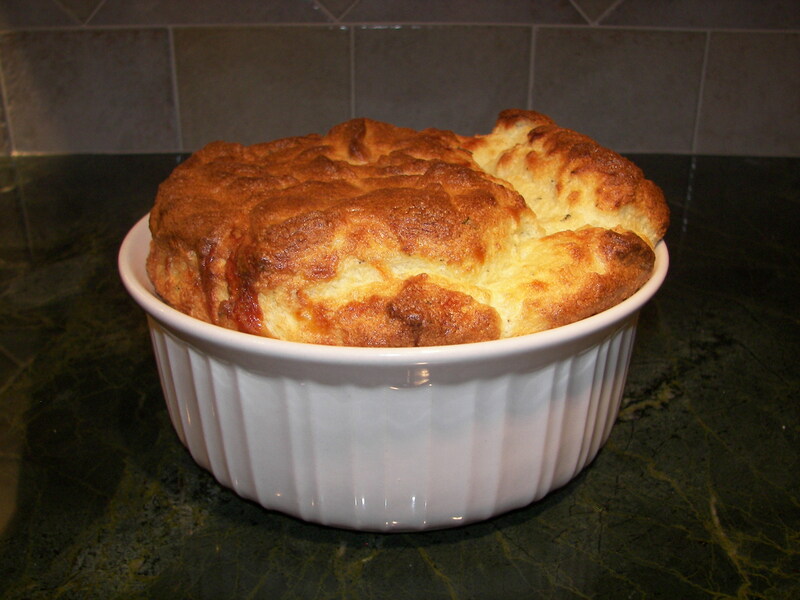 Place the tablespoon of butter into the soufflé dish and bring to room temperature. Using paper towel, smear the butter around the dish so the inside is evenly covered. 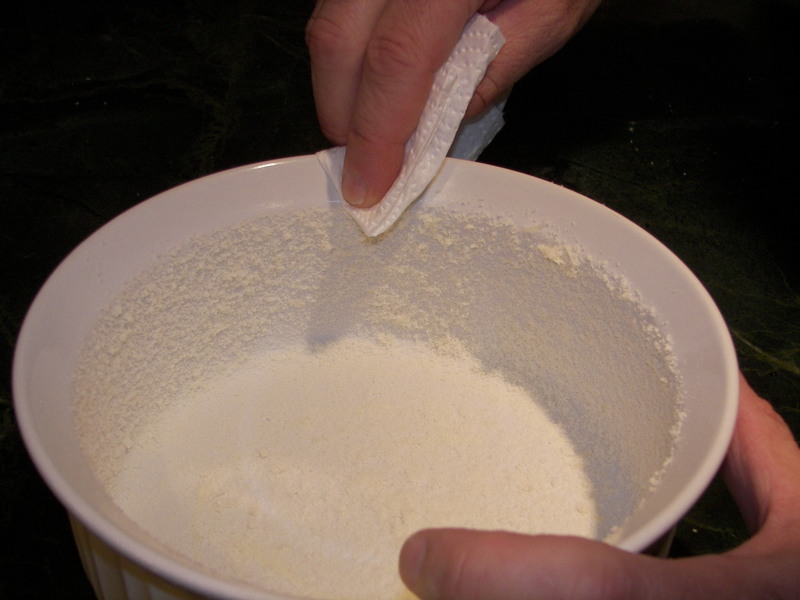 Pour the grated Parmesan Cheese into the dish and rotate it so an even coating clings to the entire inside of the dish. Pour out excess cheese and place dish into the refrigerator to cool. This will help the butter/cheese coating to set. Begin by preparing a roux. Melt the butter in a medium size sauce pan over low heat. Add the flour. Stir over low heat until the flour and butter combine to form a smooth consistency. Hint: The roux will smell like cookie dough instead of raw flour when it is done. Make sure you don’t over-cook it. This will cause the roux to turn brown. 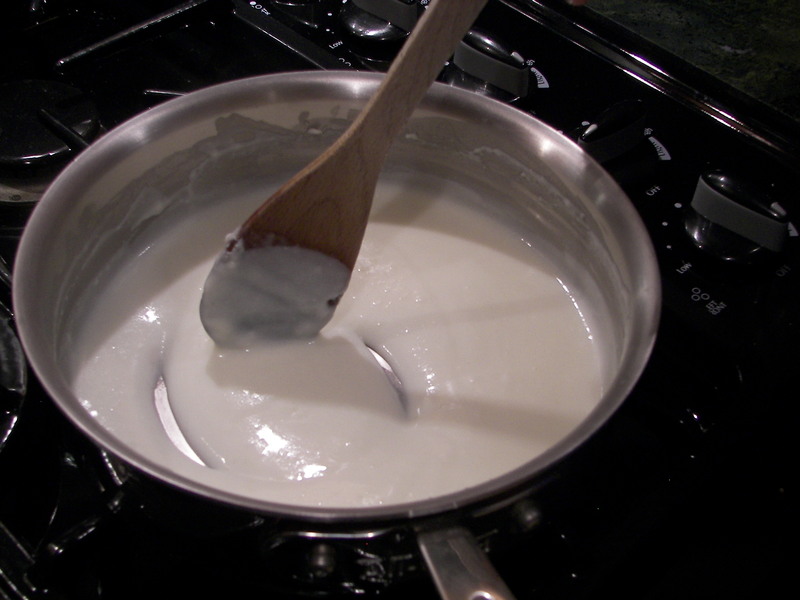 Béchamel is traditionally a white sauce. 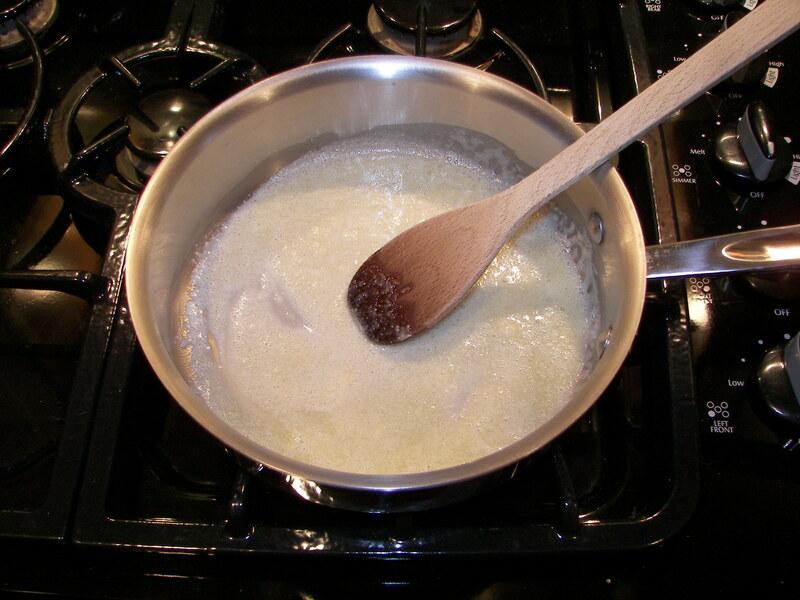 A brown roux will result in a brown béchamel. While the roux is cooking, preheat your oven to 350 degrees. Place the milk in a small sauce pan. Bring to a low simmer on top of the stove. Stir occasionally to prevent scalding. The temperature of the milk should be hot but not boiling. Raise the heat under the roux to medium and add about ¼ cup of the milk. Whisk briskly to combine. The milk should thicken immediately. This preliminary step helps eliminate lumps from the final product. Add the remaining milk and continue whisking until the béchamel is thick and creamy. It should have the consistency of yogurt. Set aside while you whisk the egg whites. Sprinkle the Cream of Tartar and a big pinch of salt on the egg whites before you start whisking. The Cream of Tartar can be omitted if you are using a copper bowl. 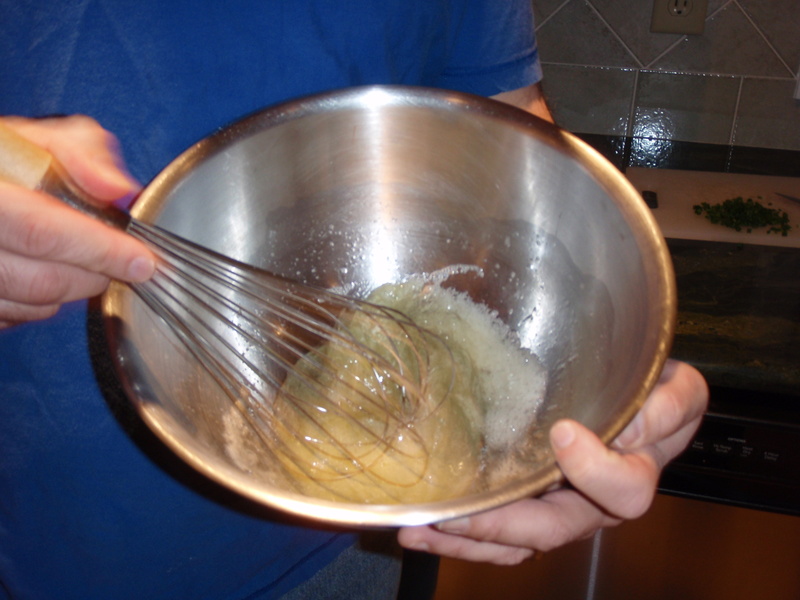 Use a large balloon whisk. Begin with a few swift side-to-side strokes to break the egg whites up. Then continue to whisk in a circular motion until the egg whites have tripled in volume and stiff peaks can be formed. Set the egg whites aside once they reach the stiff peak stage. Note: Stiff peaks occur when you remove the whisk from the bowl and the remaining egg whites form a point or “peak” at the spot where they separate from the egg whites clinging to the whisk. If the peak stands up straight, they are considered “Stiff Peaks”. If they flop over, they are considered “Soft Peaks”. Fold the egg yolks into the béchamel until they are well incorporated. Add the Gruyere Cheese and herbs. Stir gently to combine. 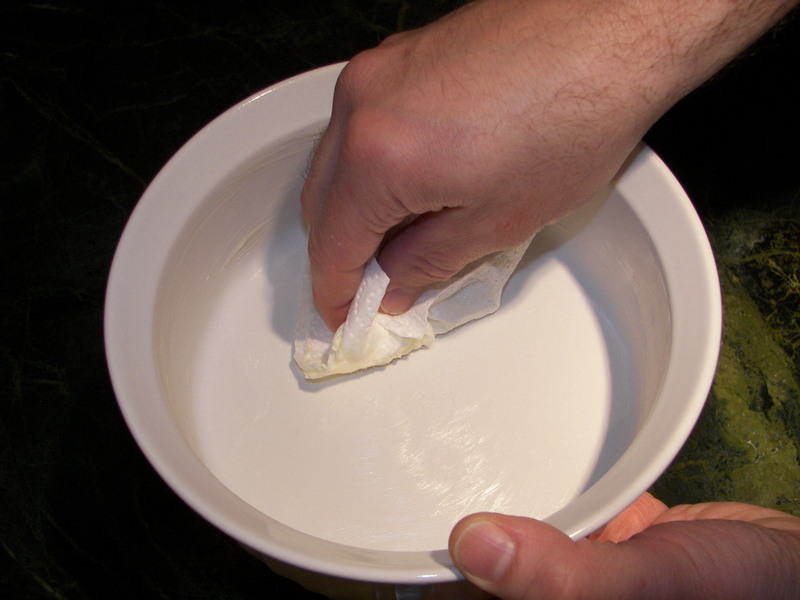 Place the Bechamel into a clean bowl large enough to accommodate both the béchamel and egg whites. Begin by adding a small scoop of egg white (about ½ cup) and add to the béchamel mixture. Stir lightly to combine. Gently fold in the rest of the egg whites. Be careful not to over mix the two. Spoon the combined soufflé mixture into the prepared dish. Gently tap the dish on the counter top to make sure the mixture settles properly. Smooth out the top with a rubber spatula. This will help the Souffle rise evenly. The dish should be about ¾ of the way full. Note: It is very important to wipe away the remaining butter and cheese that clings to the top portion of the soufflé dish. Failure to do so could prevent the soufflé from rising properly. Use a Kitchen Towel or paper napkin to complete this task. The remaining ¼ of space around the inside of the dish should be as clean as possible. Place the dish in a preheated oven and bake for approximately 30 to 45 minutes. The Soufflé will be done when the top is nicely browned and it has risen about 2” or 3” over the rim of the dish. A skewer inserted into the middle should come out clean.